Place a 4-fold or Acca bet with min. odds 1/5 (1.2) and then boost your wins up to 77%! The more selections you make, the further your Royal Boost will take you! Each selection in the acca bet must be at odds of at least 1/5. The maximum 'Extra Winnings' shall be £11,000 or currency equivalent. Bets placed wholly or partly with a Free Bet are not eligible for the Royal Boost bonus.Cashed Out bets placed with the Royal Boost bonus are not eligible for 'Extra Winnings'. BetRegal pride themselves on offering a good customer service with 24/7 support that offers live chat, phone and email support that will be responded to in the most efficient response time. The site has a very user friendly basis that any already existing customer can vouch for, with the bet slips very easy to view and all up coming events very neatly displayed and easy to find. 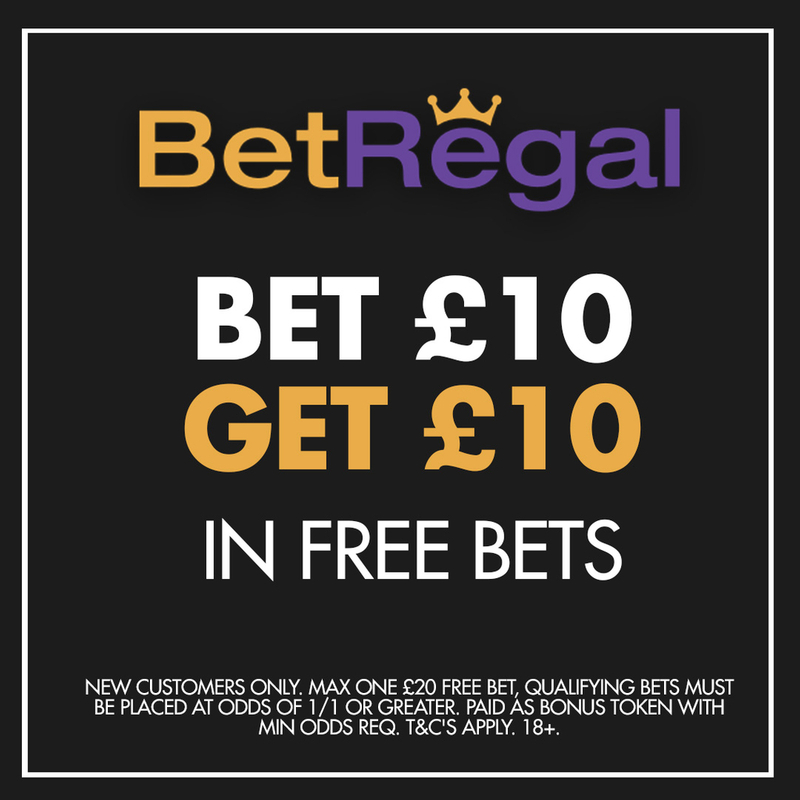 BetRegal offer some of the most competitive odds in the industry, they are produced in a digital format again in a very user friendly environment for customers. With this the site offers very fair and generous betting limits for customers to be able to stake responsibly. The same as many bookmakers BetRegal endorses responsible gambling as you can set your own limits daily, weekly, monthly and yearly. BetRegal offer such a huge range of different sports that the customer is able to bet on with the most frequently used sport being football in which promotions are usually channelled through. The site offers over 30,000 different matches with the specific matches you wish to bet on very easy to find. Tennis is another fan favourite at this bookmakers with around 600 different games being able to bet on at any one time. Basketball, Ice Hockey and Volleyball are other key sports that are frequently bet on at the site with BetRegal also offering a huge range of other sports to get stuck into. Offer valid only to customers making a first deposit of £20 or more and make a qualifying bet in accordance with the Free Bet Specific Terms and Conditions. Offer only applies to players who are residents of the United Kingdom, Sweden, Norway, Finland, Germany, Switzerland and Austria. One Free Bet token will be awarded once you have made your first deposit and have bet £20 on sports with odds of over 2.0 (1/1). This bet must be settled within 14 days of bet placement to qualify for the Welcome Free Bet offer. BetRegal may cancel, amend or modify any promotion, competition, bonus or special offer by publishing the amended or modified terms or notice of cancellation on the relevant internet page of the promotion, competition or special offer. Such amendment, modification or cancellation shall take effect following the expiry of a period of 14 days of such publication, or with immediate effect, where required for security reasons, to comply with applicable law or regulation, due to abuse or otherwise where the promotion, competition or special offer is not capable of being conducted as specified as a result of exceptional circumstances.Please note that BetRegal will not exercise this right to amend, modify or cancel any promotion, competition of special offer under this term for players who have already opted into the relevant promotion, competition or special offer, made a deposit in expectation of receipt of a bonus or otherwise commenced play in relation to the relevant promotion, competition or special offer where to do so would affect the ability of these players to:o Receive or accrue the relevant bonus. o Use, access or retain any bonuses already received or accrued.Except where the relevant Customer(s) has engaged in fraudulent or unlawful behavior or where the amendment, modification or cancellation of the promotion is required to enable Us to comply with our legal and/or regulatory obligations. Notwithstanding anything else in this Bonus Policy or any additional terms or rules which govern the provision of any gambling promotion to players, players shall not be prevented from withdrawing:o Their deposit balance. o Winnings from any bonus which are not subject to wagering requirements or restrictions (or for which wagering requirements or restrictions have been satisfied).Except where BetRegal is required to prevent such withdrawal of funds in order to comply with legal and regulatory obligations (including anti-money laundering requirements).